T. Wang, C. Begau, G. Sutmann, A. Hartmaier. Microstructural diagram obtained from MD simulations with different spraying velocities, diameters and initial temperatures of the particles. Thermal spray processes are widely used for the manufacture of advanced coating systems, e.g. metallic coatings for wear and corrosion protection. The desired coating properties are closely related to the microstructure, which is highly influenced by the processing parameters, such as temperature, size and velocity of the sprayed particles. In this paper, large scale Molecular Dynamics simulations are conducted to investigate the microstructure formation mechanisms during the spraying process of hot nano-particles onto a substrate at room temperature using pure copper as a benchmark material representing for a wider class of face-centered-cubic metals. 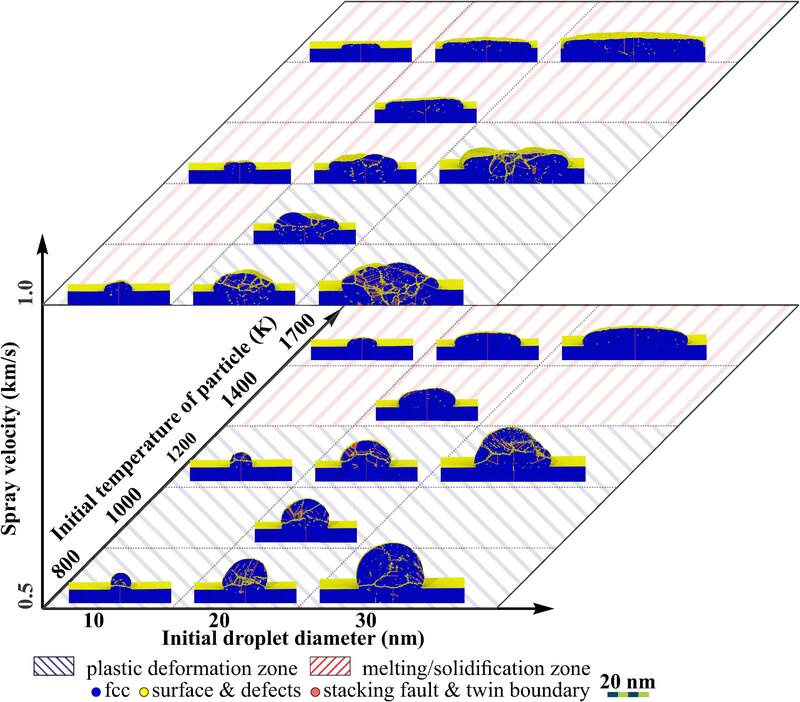 To evaluate the influence of processing parameters on the coating morphology, a number of simulations are performed in which the initial temperature, size and velocity of copper particles are systematically varied in order to investigate the thermal and microstructural evolution during impaction. Two distinct types of microstructural formation mechanisms, resulting in different coating morphologies, are observed in the present investigation, which are either governed by plastic deformation or by the process of melting and subsequent solidification. Furthermore, a thermodynamically motivated model as a function of the particle temperature and velocity is developed, which predicts the microstructural mechanisms observed in the simulations. The results provide an elementary insight into the microstructure formation mechanisms on an atomistic scale, which can serve as basic input for continuum modeling of thermal spray process.